a. Brickell Park contains both a pre-Columbian archeological site and a historic mausoleum associated with the Brickell family. As early as the 1860s, pre-Columbian sand mounds were noted here as part of a large hammock extending south from the Miami River. Recently, intact deposits of midden material (or refuse) associated with the pre-Columbian Tequesta occupation were identified within this area. Several Native American burials also were identified that may be related to the inhabitants of the Miami Circle site. In fact, the density of burials suggests that this area was deliberately selected as a cemetery.The Brickell family located its mausoleum at this site. 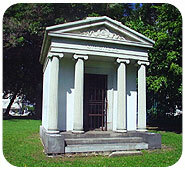 The mausoleum is the only surviving structure associated with one of Miami's most important families. It was listed in the National Register of Historic Places in 1989.